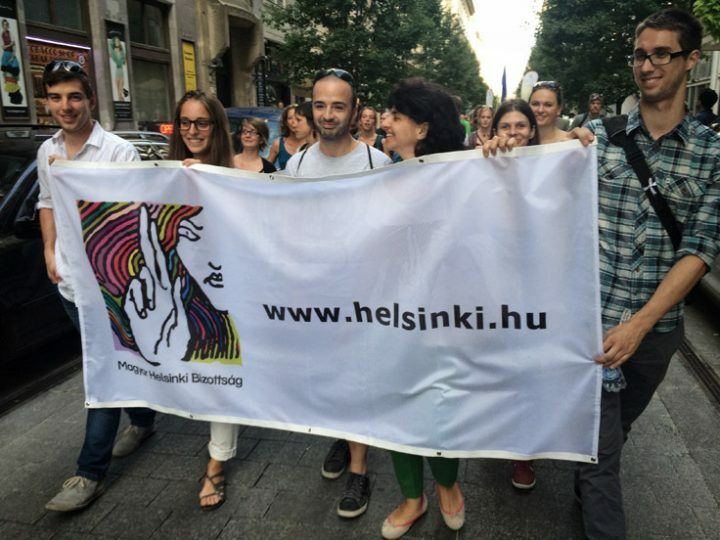 We publish here the press release from the Hungarian Helsinki Committee, a non-governmental watchdog organisation that protects human dignity and the rule of law through legal and public advocacy methods. Budapest, 20 June 2018 — On World Refugee Day the Hungarian Parliament adopted Bill T/333, a new version of the 2018 Anti-NGO package, and the Seventh Amendment to the Fundamental Law of Hungary. Although the adopted version of the attack on civil society organizations differs significantly from its two previous versions, the threat it poses is even more severe and unacceptable. The primary aim of this legislation is to intimidate, by means of criminal law, those who fully legitimately assist asylum seekers or foreigners, protecting humanitarian values and the right to a fair procedure. It threatens with jail those who support vulnerable people. This runs counter to all we consider as the rule of law, European and Christian values. The Criminal Code provision (Section 353/A on ‘promoting and supporting illegal migration’) uses vague notions; hence it breaches the criteria of legal certainty. The sanctions concerning the activities of civil society organizations clearly breach the right to freedom of expression and the freedom of association, which are protected not only by the Fundamental Law of Hungary but also by the European Union Convention on Human Rights and the European Union Charter on Fundamental Rights. The new law breaches EU law on asylum and migration thus is also against Hungarian domestic law itself, from several points of view. It violates the right of asylum-seekers to a fair trial as in practice it limits their right to receive information and legal representation from a legal assistance provider of their choice. Furthermore, it violates the right of any non-EU national to receive information or seek legal assistance concerning their residence rights under EU law as the newly adopted law threatens to jail those who provide information, including attorneys, in these cases as well. The Council of Europe Parliamentary Assembly Legal Affairs and Human Rights Committee requested an opinion from its constitutional expert body, the Venice Commission and from the OSCE Office of Democratic Institutions and Human Rights (ODIHR) on the compliance of a previous Anti-NGO bill, submitted in February, with international human rights standards. Since a brand new proposal was submitted to the Hungarian Parliament on 29 May, the mandate of the Venice Commission was confirmed to examine how NGO activities will be affected in Europe under the new bill. The Venice Commission will adopt its final opinion at its plenary session on 22-23 June 2018. On Monday, 18 June, the President of the Venice Commission requested the Hungarian Government to wait until the adoption of its final opinion and to take the Commission’s recommendations into consideration. However, the Government did not even wait for two days to at least keep up appearances. It did not comply with the requests of the Venice Commission, despite a similar call from the European Peoples’ Party. Forced into adhering to the speed of the Hungarian legislative procedure, the Venice Commission sent its draft report to the Government on Friday 16 June, in a record time of less than two weeks. The draft report clearly states that the current amendment to the Criminal Code is unacceptable as it violates the principle of legal certainty as well the right to freedom of expression and freedom of association. According to the Venice Commission, if the government wishes to pursue the legislation, it would need to make several key changes to comply with European norms. For example, the law should make it clear that humanitarian assistance, help in launching an asylum procedure and advocacy campaigns should not be criminalized. As part of its propaganda war waged on refugees, the government-proposed amendment to the Fundamental Law, which restricts asylum to persons who come directly from persecution, will practically prevent asylum authorities from conducting an on-merit assessment of asylum claims. No one will ever ask why someone fled their country, instead, asylum claimants will be automatically sent back to the country from where they had arrived to Hungary. Since January 2018, only 2 persons on average per working day are allowed to enter the transit zones at the southern border to lodge an asylum application. Between 1 January and 30 April, Hungary granted protection status to 267 asylum-seekers and rejected 326 applications. A direct consequence of threatening those who assist refugees with imprisonment is that asylum-seekers will be shut off from assistance, as anyone under criminal prosecution will be automatically banned from the border area, including the transit zones, where all asylum-seekers are automatically detained for the entire duration of the asylum procedure. Asylum-seekers will hardly be able to appeal an asylum decision without proper legal assistance advice and representation, which will in practice, be an insurmountable obstacle in their right to have access to court. If a case cannot be reviewed by an independent court, there is no chance to remedy either. The government does not leave anything to chance: it is creating a new administrative court system, separate from the existing court structure, which jeopardises the independence of the judiciary. In this regard, the Hungarian Helsinki Committee recently published its analysis, Attacking the Last Line of Defence: Judicial Independence in Hungary in Jeopardy. “The Hungarian government, instead of protecting refugees from persecution, has decided to join the ranks of the persecutors. Seeking asylum is not a crime. Providing legal assistance to asylum-seekers is not a crime either. Everyone has the right to be informed about the law and to know what to expect during legal procedures. To provide information to defenceless people on their rights, to give a free attorney to people who are unfamiliar with the law is a fully legitimate activity and is in full respect of European standards and ethics. This is one of the core mandates of the Hungarian Helsinki Committee. Just like in the past, we will firmly and expertly give protection to all of our clients, civil society organisations and human rights in Hungary,” said Márta Pardavi, co-chair of the Hungarian Helsinki Committee. The Hungarian Helsinki Committee will seize all available legal and advocacy opportunities to challenge this law that breaches fundamental rights and EU law. In light of the breaches of EU law, the European Commission should immediately launch infringement proceedings, which should be carried out in an accelerated timeframe. Should criminal proceedings be initiated against Hungarian Helsinki Committee staff or any attorney we work with, we stand fully committed to protect them with all legal and public means. Furthermore, we are also ready to provide our legal expertise and, to the extent of our capacities, free defence counsel to anyone against whom a criminal procedure is initiated under this law for carrying out ethical and human rights respecting humanitarian work on behalf of asylum-seekers. Finally, the Hungarian Helsinki Committee will continue to provide legitimate and free-of-charge legal assistance to asylum-seekers who seek our assistance and who have applied for asylum with the Hungarian Office of Immigration and Asylum.